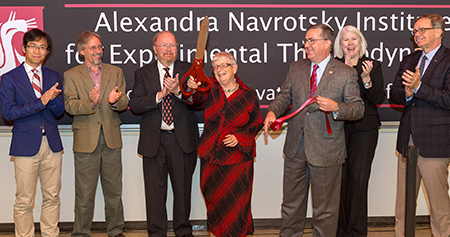 PULLMAN, Wash. – Washington State University announced today the creation of the Alexandra Navrotsky Institute for Experimental Thermodynamics, made possible by a $1 million gift from Alexandra Navrotsky, Distinguished Interdisciplinary Professor of Ceramic, Earth and Environmental Materials Chemistry at University of California-Davis. Navrotsky recently made a similar gift to UC Davis. The new WSU institute will be part of the Gene and Linda Voiland School of Chemical Engineering and Bioengineering. Navrotsky’s gift will create an endowment to support experimental thermodynamics research. The endowment will be used to advance the careers of aspiring scientists, including two of Navrotsky’s former Ph.D. students who recently joined WSU’s chemical engineering and chemistry faculty. The endowment will support research, purchase new equipment and provide supplemental funding to help attract and retain outstanding Ph.D. program graduate students and/or postdoctoral scholars, with preference given to women. “This transformational and generous gift is a testament to the importance of advancing research and the development of new ideas,” said WSU President Kirk Schulz. “We are both honored and grateful to receive this gift from Alexandra Navrotsky, which helps grow the University’s reputation and attract top graduate students. UC Davis has benefitted from 20 years of Navrotsky’s active research program in the Peter A. Rock Thermochemistry Laboratory. She has also established an endowment for research in that laboratory and hopes to add to it in the near future. Her gifts to WSU and UC Davis will sustain her legacy in advancing experimental thermodynamics and in educating Ph.D. students and postdoctoral scholars, serving as an exemplar for generations of scientists, and leading fundamental, innovative, experimentally based thermodynamic (calorimetric) research. Navrotsky’s research has centered on relating microscopic features of structure and bonding to macroscopic thermodynamic behavior in minerals, ceramics, and other complex materials. Using high temperature reaction calorimetry as a foundational tool, she has contributed to a broad spectrum of application areas, ranging from mineral thermodynamics to ceramic processing to zeolites. She has published more 700 scientific papers. She has received many top honors, including the Benjamin Franklin Medal in Earth Sciences, the Harry Hess Medal, the Goldschmidt Medal, and the Kingery Award. She is a member of the National Academy of Sciences, the American Philosophical Society and the World Academy of Ceramics, a Fellow of the American Ceramic Society, the Mineralogical Society, the American Geophysical Union, and the Geochemical Society. Professor Navrotsky serves on numerous advisory committees and panels in both government and academe.